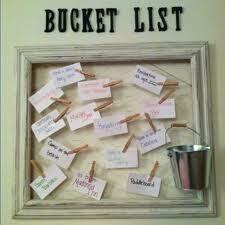 It's the start of a New Year - a time to reflect and compose our bucket lists! The first thing you will notice is that I decided to have someone do a blog design for me. It wasn't huge on my bucket list, but something I have been wanting to do for some time now. I've been fatootsing with my blog for months, constantly changing it, never satisfied. So here's the new me! Hope you like it! This week’s Sunday Supper is all about trying something new, something that’s been on your bucket list but you have yet to tackle. We have had so much fun with this and are happy to share these recipes with you! I received a pasta machine from my Mother-in-Law over a year ago and have always wanted to make fresh pasta! I finally started cranking out - not only fresh pasta, but Polish Pierogi, Cookies - anything that requires a thin dough. In a medium saucepan, heat the oil over medium heat Add the leeks and cook until softened, about 3 minutes. Let cool. In a large bowl combine ricotta, Parmesan cheese, parsley and sauteed leeks. Season with salt and pepper and stir in the egg. Chill mixture while you make your pasta. Combine all ingredients for the pasta in a stand mixer. Using the dough hook, mix until combined and knead for about 5-6 minutes until smooth. Cover with plastic wrap and let rest for one hour. Divide the pasta into 6 equal portions. Working with one piece of dough at a time, pass the dough through the pasta rollers starting with the widest setting and ending with the next-to-last setting. Using a small ice cream scoop, make a row of filling mounds along the length of the pasta sheet. Brush the dough with cool water along the edges and in between fillings to help seal. Trim the edges with a pastry wheel, and cut into rectangles between the fillings. At this point, ravioli can be refrigerated up to 4 hours or frozen. Bring 6 quarts of salted water to a boil. Slip the ravioli into the boiling water a few at a time. Return to a boil, stirring gently until ravioli rise to the top. Boil for about 5-6 minutes after the water returns to a boil. Serve with your favorite marinara sauce and grated cheese. These ravioli melt in your mouth. One day I'll get the pasta rollers for my KitchenAid mixer and be able to make homemade pasta. Hopefully it would turn out as beautifully as yours. Oh my it is gorgeous! Oh yummmm. Making homemade pasta is seriously awesome, isn't it? It just has a special flavor and texture to it. Your ravioli look amazing! First, your redesign looks amazing! Second, send me some ravioli please? Ravioli is my nemesis! I need to try again. Yours is amazing! Your ravioli turned out beautiful... just looks delicious. Congrats on crossing off something on your bucket list. One of my favorite dishes to make at home. Nicely done and love that you did some freezing for another time. This are absolutely wonderful! 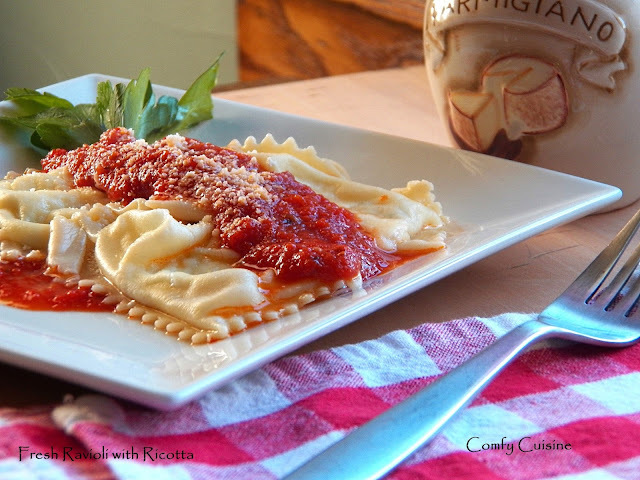 I love everything about these ravioli and making them at home it´s unbeatable! What a gorgeous picture!! You have just done me in, I have to go and get something to eat right away. I truly wish it was this!! Patti!!!!! This is one of the most beautiful pics I have seen of ravioli's... love that you made them extra large and rectangular! I only wish I lived next door! I also plan on making homemade ravioli this year. Your picture looks gorgeous, I hope mine turn out as well! This looks just wonderful - both your new look and your ravioli! I made ravioli for the first time recently since I was in school a few years ago, and it just spoiled me for store bought now. Congrats on your recipe!! I love the new look of your blog! I want to get someone to do one for me too but I just haven't gotten around to it. Onto the bucket list that task goes ;) Making pasta is on my bucket list too. This ravioli looks so incredibly good. I love how it has a simple but delicious filling and that you were able to make enough to freeze. Wow, that is the prettiest ravioli I have ever seen! Your new look is very nice as well! Beautiful ravioli! It's one of our favorite things to make at our house but we use a ravioli mould. Your way looks much faster so we'll definitely give it a try the next time. They look amazing, great job! For years I have been cheating and just using wonton wrappers to make ravioli. But a year ago I was given a pasta machine so I keep telling myself that I am going to make it properly. It looks so good even though it is only 6am I want to dig in right now. I LOVE this!!! Your ravioli looks so pretty and fantastic! I also have to tackle homemade fresh pasta and break out my new pasta maker. . can't wait!!! Love this!! Love making fresh pasta. Doing ravioli is on my list for this year too - yours looks wonderful! Lovely Patti! I love homemade pasta dishes.